This exhibition features monoprints by three Maine-based artists. Karen Adrienne creates colorful, dimensional pieces through repeated printing, layering of ink, and folding of paper to explore the beauty and complexity of water, her primary inspiration. Kris Sader’s pieces, based on Cape Cod, are small and highly textural prints created through many layers of ink. Barbra Whitten creates large abstractions using layering of printed broken text. The various bits of letters are recognizable and familiar, but in abundance create spaces and vortexes and that defy any context. The three artists create vastly different work, but they share a tendency toward layering, repetition and creating a sense of tangibility through abstraction. “Ripple Effect” speaks in some cases to the subject matter inspiring the work, but also to the physical texture, patterning, and sense of accumulation and momentum these artists manage to achieve within their work. 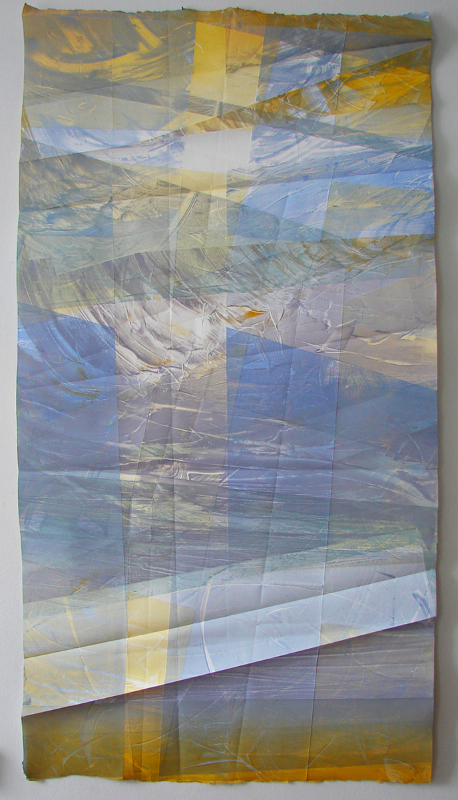 Though responding to different thematic influences, Karen, Kris and Barbra all use print-making techniques to take a small moment, be it a line, pattern or fold, and expand on that moment in various ways within each piece and body of work. Karen Adrienne was born in St. Louis, Missouri into a working class family with four brothers. She left the Midwest in 1967 and began her journey westward. She eventually earned her B.A. 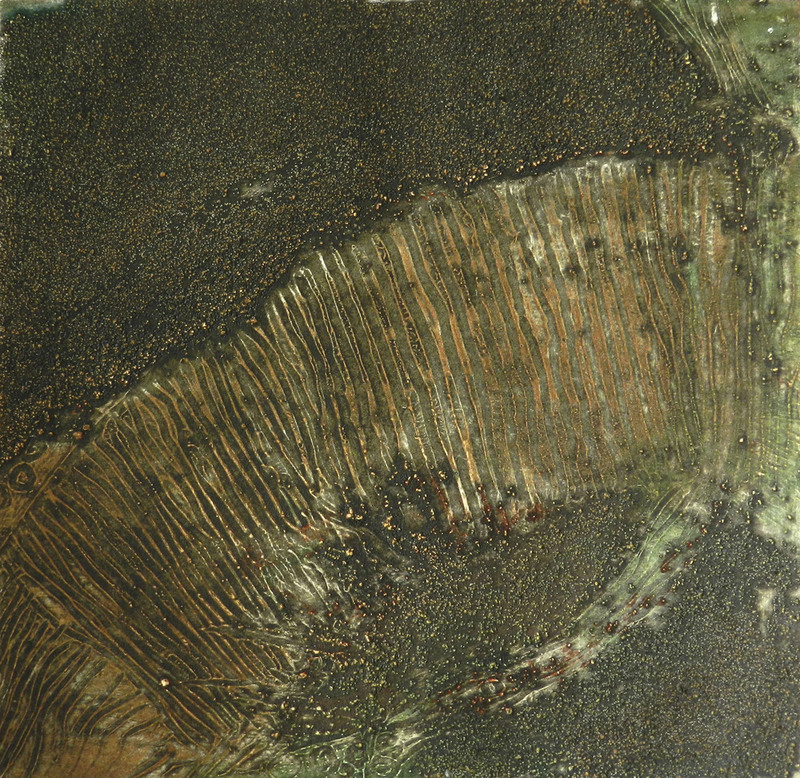 Art with a concentration in Printmaking in 1979 from Southern Utah University and returned to the Midwest to earn an MFA in printmaking from Northern Illinois University in 1982. After teaching in private and public colleges and universities in the Midwest for five years, she moved to Maine where she has lived and worked ever since. She has taught Printmaking, Drawing, and Bookmaking at the University of Maine @ Augusta since 1987. Her print works have been exhibited nationally and internationally and she has received numerous grants and artist residencies. Her travels have informed her creative work and influenced the media used. In 2005 Karen opened Artdogs Studios, and in 2007 Circling the Square Fine Art Press. Both of these businesses are housed in a rehabilitated four story building in the historic district in downtown Gardiner. Kris Sader was born in Denver, Colorado in 1951, but grew up in Tucson, Arizona. She studied Art and Theatre at the University of Arizona and Northern Arizona University. Since marrying she, her husband and two daughters lived in many places from the West coast to the Gulf Coast and in-between. In 1987 the family moved to Maine. Kris holds three degrees from the University of Maine, a BA in Performing Arts/dance, 1989, MS in Ecology and Environmental Sciences, 1995 and a BFA in Studio Art (printmaking) 2005. Barbra Whitten was born in southern Maine and grew up in the small coastal town of Kennebunk. After earning a BS in biology from Eastern College in St. Davids, PA in 1993, she returned to Maine and worked as an elementary-level school teacher for several years. She also served as the coordinator of China Lake Baptist Camp (a residential summer and winter camping program for children and teens) in China, Maine from 1997-2001. In 2005, Barbra left her teaching career to pursue part-time studies in art and architecture at the University of Maine at Augusta (UMA), where she received a BA in studio art, with a concentration in drawing, in 2011. Now residing in midcoast Maine, she currently supports her artistic endeavors by working as a gallery assistant in Camden and as a pre-school teaching assistant in Rockland.